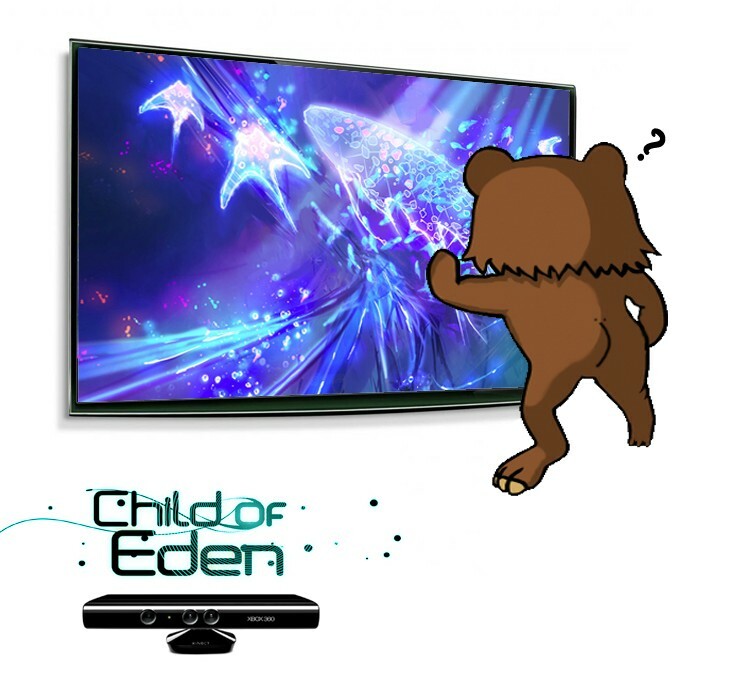 Child of Eden is the ultimate evolution of games like Space Harrier, Panzer Dragoon, and Rez. September 11th 2019, the first human is born on the International Space Station, her name is Lumi. She grew up to have a very beautiful voice and enjoyed singing to the people living on Earth. She was probably more popular than Beyonce and Janet Jackson combined. When Lumi eventually died, Lumi's body was preserved and her thoughts and memories were archived. Ahhh, the wonders of technology. Centuries later, people are still on the Internet, but it's called Eden now. The scientists of the 23rd century wanted to infuse Eden with a personality, so they decided to use the Lumi archives, probably because she was so amazing. Her persona and beauty are now apart of Eden. Again, the wonders of technology. The problem is, some kind of cosmic virus is attacking Eden as a whole, and it's your Kinecting job of saving the Internet AND the girl. From the moment you put your hand out towards the main-menu, you'll see just how improved Kinect controls have become. Super fluid 60 FPS graphics really help to compliment the Kinect feeling. You'll be moving the on-screen targeting reticle around at a damn-near 1:1 ratio, and it feels very snappy. (Even better than the Dashboard's cursor control). You can tell they spent a long time trying to perfect this feeling. If you don't like the default setting there are options to adjust how it feels. Much respect goes to Q? Entertainment here. During gameplay your right hand is your lock-on lasers. You can select up to 8 enemies on screen just by passing your hand over them. To unleash your attack, just push forward! Very satisfying feeling here. Your left hand is your rapid-fire "Tracer" attack, constantly blasting the screen with colored light bullets wherever you like. There are specific enemies who are more vulnerable to your 2 main attacks.. you will learn how to use them as the game progresses. There is an alternate way to play, where both hands shoot the same attack, and you can clap your hands together to switch between the 2 weapons. Graphics are incredibly crisp, and a joy to look at. This is pure eye-candy, with alot to see and interact with. One of my favorite Kinect moments was when there are literally thousands of colored blocks on the screen that you can seemingly push around with your hands.. such an amazing effect. Stoners will be in heaven here. As you play and shoot down enemies, you can sometimes collect a health item or "Euphoria" attack, which clears the screen of enemies if you raise both hands. At any time you can press a button on your controller to play with it instead, and press the 'Back button' to instantly revert to Kinect mode. By the way, we finally have a Kinect game that isn't taking photos of you jumping around in your t-shirt & briefs and saving them for your friends to see later. You only ever see your silhouette briefly in the top corner when Kinect is adjusting to you. Music Sound and Gameplay infusion! I hope you like good electronic music! Each level you'll be experiencing has its own vibe, the music is always very progressive - sometimes soothing, sometimes pumping, always fun to be part of as you play. Turn up the bass if you can because every level has a funky beat. Not enough bass? I'm not suggesting that you tuck a controller or 4 in your pants while Kinecting- but if you did, you would have vibrational feedback during a Kinect experience for the first time. Crazy? Yes, Fun? Yeaaaa it is. There's a good number of unlockables in the game, from "pets" for the main menu, to visual filters for gameplay. Replay value is there. Child of Eden is a visual and auditory treat that I fully recommend to anyone looking for a different experience from their videogames. This is the best "Better with Kinect" game thus far, hell- it might be the best Kinect game period. Seems like we've got another "Games as Art" contender here!